Help save homeless, abandoned and injured animals in need and register for Peggy Adams Animal Rescue League’s 18th Annual Barry Crown Walk for the Animals on Saturday, February 23, 2019, at a new walk location - Meyer Amphitheatre, located at 105 Evernia Street in West Palm Beach, Florida. This pet-friendly walk begins at 9:00am with check-in and registration, live entertainment and a free breakfast. At 10:15 am after opening ceremonies, participants will enjoy a scenic walk along the West Palm Beach Waterfront down Flagler Drive. As participants complete the one-mile route, they'll enjoy pet costume contests with amazing prize baskets on the Meyer’s center stage. Categories include Best Dressed, Most Creative, Owner/Pet Look-A-Like and Best in Show. There will also be live entertainment, local vendors, and a fabulous silent auction and raffle area with great prizes. The event concludes at noon. Participants are encouraged to pre-register to walk and form teams. Each registrant who raises at least $35 will receive a free t-shirt and a special gift for their pet. Plus, many other fundraising opportunities to earn amazing incentives. Awards will be given out that day for the top team fundraiser and runner up. 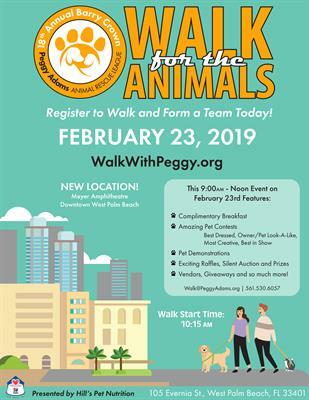 "Our Walk for the Animals has grown tremendously over the years and we are very excited to have this year’s Walk in Downtown West Palm Beach at the Meyer Amphitheatre,” said Rich Anderson, Executive Director/CEO of Peggy Adams Animal Rescue League. "As a nonprofit that receives no city, state or federal government funding, Peggy Adams relies on community support to help us provide services to tens of thousands of dogs, cats, puppies, and kittens every year, we are extremely grateful to all of those who get involved in this event." All proceeds benefit Peggy Adams Animal Rescue League. The Walk is presented by Hill’s Pet Nutrition. Other sponsors to date include: Nozzle Nolen Pest Control, Scenthound, Very Important Paws, NCCI, Residence Inn - Downtown West Palm Beach/CityPlace, HomeAgain, Searcy Denney Scarola Barnhart and Shipley, DogsWorld Resort, Jolene & Larry Shapiro, and Velocity Community Credit Union. To learn more about the 18th Annual Barry Crown Walk for the Animals and/or sponsorship opportunities, please visit www.WalkWithPeggy.org or call 561-530-6057. Free, Fundraising Incentives start at $35 raised.